Interest groups have a role in shaping public opinion across Europe, but does an interest group’s reputation affect its ability to influence the views of the public? Drawing on evidence from two survey experiments, Andreas Dür explains that interest groups only appear to matter due to the arguments they put forward, with the reputations of particular groups having a surprisingly low impact on whether citizens find their arguments convincing. This suggests that citizens do not identify with interest groups in the same way as they may identify with political parties. Interest groups are frequent contributors to public debates. They engage in campaigns that try to shape public opinion on topics as diverse as the Brexit negotiations, climate change, and migration. Some of these attempts to affect public attitudes are quite successful. For example, campaigns launched by environmental NGOs have likely increased public awareness of the consequences of climate change. But how does this process through which interest groups influence public opinion work precisely? Does it matter which groups make which arguments? And does the groups’ reputation matter? In an article recently published in the European Journal of Political Research, I tackle these questions head on. To do so, I rely on two experiments that were embedded in public opinion surveys. In such survey experiments, different groups of respondents get varying question wordings or slightly changing hints before answering a question. Comparisons across the groups then allow for inferences about the causal impact of the treatments. In the first experiment, I asked a total of 6,826 respondents in three countries (France, Germany and the United Kingdom) about their views of the Transatlantic Trade and Investment Partnership (TTIP). These trade negotiations were highly publicly salient in many European countries, with interest groups heavily involved in the public debate. Business associations generally supported the negotiations, whereas most citizen groups voiced concerns. In my experiment, respondents in the control group simply were asked about their views on TTIP. A total of twelve treatment groups then received different combinations of interest group sources and arguments that these groups may make (for the full wording, see here). For example, one treatment group was told: “The employers’ association Confederation of British Industry argues that 150,000 new jobs would be created in Great Britain as a result of this planned trade agreement.” Another treatment group received the following combination of source and argument: “The environmental organization Greenpeace warns that this planned trade agreement would allow foreign companies to sue Great Britain in private tribunals for billions in compensation.” This set-up allows for an analysis of which source, argument or combination between source and argument has the largest effect on public views towards TTIP. 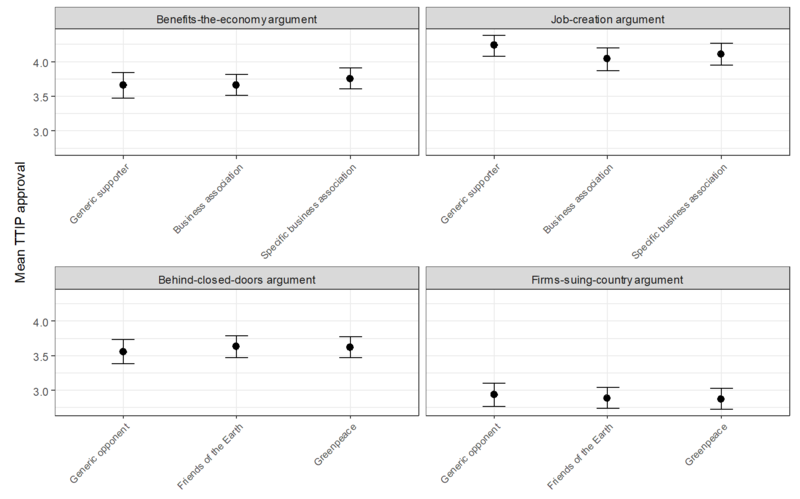 Across all three countries included in the analysis I found a highly consistent result: which source I mentioned for an argument was irrelevant for respondents’ views towards TTIP (see Figure 1). What mattered were solely the arguments themselves. For example, the argument that the negotiations for TTIP take place behind closed doors had the same (slightly negative) effect on views towards TTIP, independent of whether it was linked to Greenpeace, Friends of the Earth or simply “opponents” of the negotiations. Note: TTIP approval was measured on a 7-point scale, ranging from ‘strongly oppose’ (=1) to ‘strongly support’ (=7). The whiskers show the 90 per cent confidence intervals. This basic finding did not change when I controlled for respondents’ level of information about TTIP or respondents’ trust in the sources of the arguments. Respondents hence used the information contained in the arguments to update their opinions on TTIP, with no regard to the actor that makes an argument. A possible explanation for this finding is that respondents simply did not read the question wording closely enough. They may have overlooked the information on the sources of the arguments. However, the survey included a question right after the experiment that allowed me to check whether respondents had retained the information about the sources. The effect of this question was clear-cut: my experimental treatment did indeed manipulate respondents’ views of the actors’ positions on TTIP (but not their own views of TTIP). Clearly, then, an explanation based on inattentive survey respondents cannot account for the finding. The finding that interest groups only matter via the arguments they put forward, but not on the basis of their reputation, is quite surprising. To cross-check this finding, I used a second, completely independent survey experiment. This time I asked respondents in two countries (Germany and Spain) about their views of the Paris agreement on climate change. The change in topic allowed me to make sure that the findings are not just limited to the TTIP case. The set-up of this second experiment also differs in another aspect from the one of the first experiment (for the full wording, see here). In this case, I confronted respondents with statements that simply linked a source (“Friends of the Earth”, “large companies”, “business associations”) with a position on the Paris agreement (“supports this agreement” or “opposes this agreement”). In these statements, the actor taking a position hence gets more prominence than in the TTIP experiment. The findings closely resemble those from the TTIP experiment. Respondents that received a statement in support of the Paris agreement adopted a view on the agreement largely independent of the actor that accompanied the statement. The results from the second experiment, however, revealed one exception to the statement that interest groups do not matter as sources. In both Germany and Spain, respondents that were told that “Non-governmental organizations such as Friends of the Earth oppose this agreement” were significantly less supportive of the Paris agreement than respondents that received a statement that either large companies or business associations opposed the agreement. This indicates that interest groups can matter as sources if the position they adopt is counter-intuitive to the recipients of a message. What explains these findings? It seems that citizens do not identify with interest groups in the same way as they may identify with political parties. Whereas many people view the world through a partisan lens, this is not the case for interest groups, even if they are well known such as Greenpeace. The findings have interesting implications far beyond the specific question of interest group influence on public opinion. They show that it is possible to influence people’s attitudes towards specific public policies. But citizens do not easily let themselves be influenced by their pre-conceptions about the trustworthiness of different interest groups. Rather, they take the contents of messages seriously. This supports an optimist reading of the determinants of public opinion. Another explanation of these findings is that citizens are affected more by trust in categories of influencer groups rather than individual influencers, ie, environmental campaigners, or even just ‘NGOs’, as opposed to ‘Greenpeace’ or ‘Friends of the Earth’. So level of influence is related to how the source of that opinion source has been pigeonholed by the receiver. This explains why NGOs of all shapes and sizes seem to exert equally large influences on public debates. It’s just that the large well resourced ones like Greenpeace and Annesty are better able to get attention in the first place. Many thanks for your comment. I did not directly test this, but my results still seem partly at odds with your explanation. First, in the TTIP experiment I compared the effects of Friends of the Earth and Greenpeace with the effect of the generic term “opponents” and did not find any difference. So I do not only compare FoE with Greenpeace, but also with a generic label, without this having any effect. Second, in the climate change experiment I find no difference between the NGO pro and the companies pro treatments, although the two actors should be pigeonholed differently. The “pigeonholing” must be really strongly upset, such as with the con treatments in the climate change experiment, for this to affect respondents’ attitudes.